While our focus right now is on the 2019 offseason and games still to come this year, it's hard not to look ahead to 2020. The majority of the current roster is either playing on expiring contracts or are just signed for one year, and even Head Coach Jason Garrett is in the final year of his deal. Could the Jones family be looking at 2020 as a potential reset button for the franchise? The decision not to extend Garrett's deal beyond this season makes sense. While he has done an admirable job of keeping the team competitive since 2011, too many years have ended with disappointing playoffs misses or early exits. There have been rumors that Jerry is eyeing the Saints' Sean Payton, a former Cowboys offensive coordinator, as a potential Garrett replacement and upgrade. Payton's deal with New Orleans also ends after this season. Could the current handling of the roster, leaving just around 30 players currently signed beyond 2019, speak to a potential change at head coach? Are the Jones leaving things open so that a new coach, especially one with a profile like Sean Payton's, can come in and reshape the roster to his liking? Even the quarterback position may indicate this thinking. Dak Prescott is entering the final year of his deal and the Jones have expressed their intention to get a long-term contract done. But if they're in wait-and-see mode on Garrett, could Prescott ultimately get the same treatment? No player position dictates the personality of an offense more than quarterback. If you bring in an offensive guru like Payton, he's going to have very specific likes and dislikes for that player. Dak Prescott isn't Drew Brees, either in style or skill. Would Payton be happy with Dak as his QB for the long haul? What about Ezekiel Elliott? Dallas should eventually pick up his fifth-year option for 2020, but what if they bring in a coach with a more pass-focused approach? Will it then make sense to tie up a lot of cap space in any running back? Just look at how bare bones the roster is after 2019. You can see where a complete scheme overhaul is being made possible. The Cowboys still have a few moves not reflected here, such as Zeke's fifth-year option or that Jaylon Smith will only be a restricted free agent in 2020. But you get the idea. Also not included here are their 2019 rookies, of which at least 4-5 should make the team this season. You get a sense of just how important this draft class may be, what with so many player hitting free agency next year. Of course, this could all be circumstantial evidence. Between now and next March, Dallas might reach new deals with Prescott, Elliott, DeMarcus Lawrence, Amari Cooper, Byron Jones, and many others. And if the season goes well enough, that Jason Garrett contract extension is likely to follow. But right now, looking across the organization, the table is set for a potential major shift in personnel both in the locker room and the coaching staff. Jerry and Stephen may be looking at 2019 as more than just another season; perhaps the chance to blow things up if they're not satisfied with the results. Some fans might be willing to sacrifice this year for a sweeping change. Others would love to see Garrett and Prescott prove their doubters wrong, and probably nobody more than Jerry and Stephen. 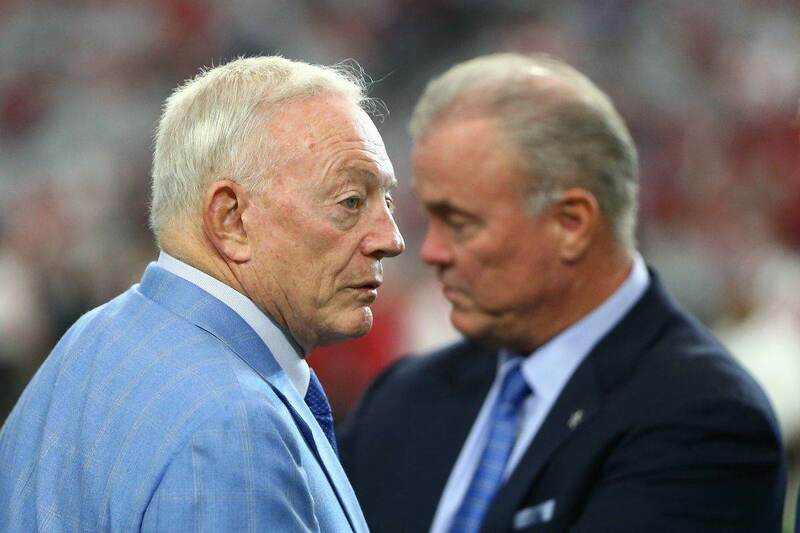 Still, only time will tell what the Jones family is really thinking about the future of the Dallas Cowboys.